How do you take care of cement tiles? That’s a question we’re often asked. But, when we suggest using a Ph-neutral soap, our answer often draws a blank look from customers. We thought we’d explain a little bit more about what we mean and link to some of our favorite cleansers for keeping your concrete tiles looking their best. The traditional soap for cleaning cement tile is black soap. Known as savon noir in France, it’s made from olive husks leftover from making olives and olive oil. The oil-based soap is neutral and gentle. In fact, the same soap that cleans your floors can be used to wash your pets! It even keeps away the bugs in your garden and naturally seals your floors. Le Savonnier Marseillais is one brand we love. The natural lavender scent is a bonus and certainly a big step up from artificially scented cleansers. You can buy it here. Other brands we love are Bauwerk (though it’s hard to find outside of Australia) and Marius Fabre which comes in both liquid and paste forms. Mixed with water, it’s the perfect soap for cleaning your cement tile floors while keep them looking beautiful and bright for years to come. Easy to clean and easy to care for, our concrete floors are the perfect choice for adding low maintenance beauty to your home’s indoor and outdoor spaces. 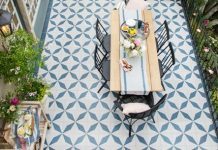 The same qualities that make our cement tiles perfect for a hardworking coffee shop or restaurant space — in addition to their beautiful designs and vivid colors, our concrete tiles are long lasting, easy care and low maintenance — make it perfect for your home, whether used as floor tile or wall tile. 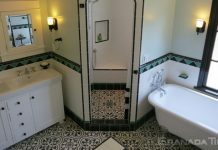 Call us today at 213-482-8070 to discuss which of our encaustic tile designs would be perfect for your home or restaurant project. 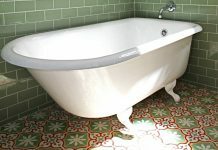 To get the look of the tiles shown here, try our Burgos tiles. 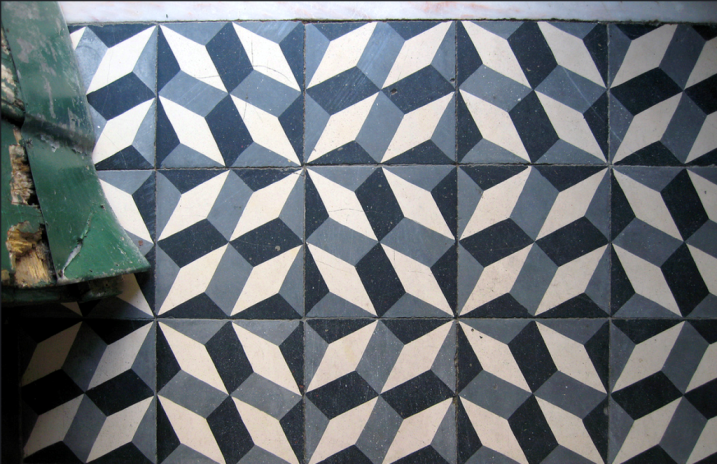 Previous articleCement Tile, Encaustic Tile, Concrete Tile…Huh?